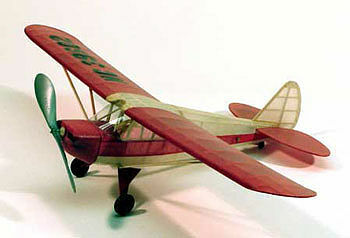 This is a Walnut scale, Rubber-Powered, Piper Cub Coupe Free Flight Model. For Beginners Learning How To Build & Fly Or The Advanced Modeler. Retail $22.95 SAVE 23% ! "Stick and Tissue" Construction (Many Small Sticks Glued Together To Form The Airplane and Then The Frame Is Covered With Tissue Paper). Over 60 Lazer-Cut Parts and Hand Selected Balsa. Light-Weight Red and White Tissue Paper Covering. Full Size Plan and Step-By-Step Instructions. Plastic Propeller, Tailwheel and 2-Two-Piece Wheels. Vacuum-Formed Cowling and Clear Plastic Windshield Sheet. F.A.I. Tan II Contest Rubber Bands. Un-Bent Landing Gear Wire and Pre-Hooked Propeller Shaft. Full Size Plans, Step-By-Step Instructions, Balsa Sticks, Lazer-Cut Balsa Sheets, Vacuum-Formed Cowling, Plastic Propeller and Wheels, Wire Propeller Shaft & Landing Gear, Tissue Paper, Decals and Windshield.